Final Fantasy XIV's servers go down tonight at midnight Eastern time. When they come back one of the MMO's most anticipated features comes with them. Are you ready for the Chocobo races, Triple Triad and mini-games of the Manderville Gold Saucer? Leveling a character and experiencing the story of the game is nice and all, but sometimes you've just got to unwind. Named after the famous amusement center from Final Fantasy VII, the Manderville Gold Saucer is a place for the denizens of Eorzea to put their feet up and have a good time. What's in store for tomorrow's visitors? Chocobo Racing—saddle up your delicious bird and urge it along as it runs a colorful course against its fine feathered friends. There's a breeding element to it as well. For the Chocobos. And other Chocobos. Ew. Triple Triad—Final Fantasy VIII's beloved card game comes to six games later, with opponents in the Saucer itself and all over the virtual world. The Cactpot—Weekly and daily lotteries give players a chance to win big. What else, what else? We've got Gold Saucer Active Time Events, or GATEs, special events like climbing challenges or dance-offs. There are mini-games to play, mounts to be won, and don't you think a certain male kitty-guy would look excellent in one of these special costumes? How many sets of ears can one character have? I'll be up early-as-hell this morning to give the Manderville Gold Saucer a go, so look for impressions of all of the attractions tomorrow, sever stability willing. I've even made a new character on the server Kirk Hamilton and Jason Schreier are now playing on, just to be close to them. If you're on Goblin, toss a friend invite to Back Front, fledgling rogue extraordinaire. 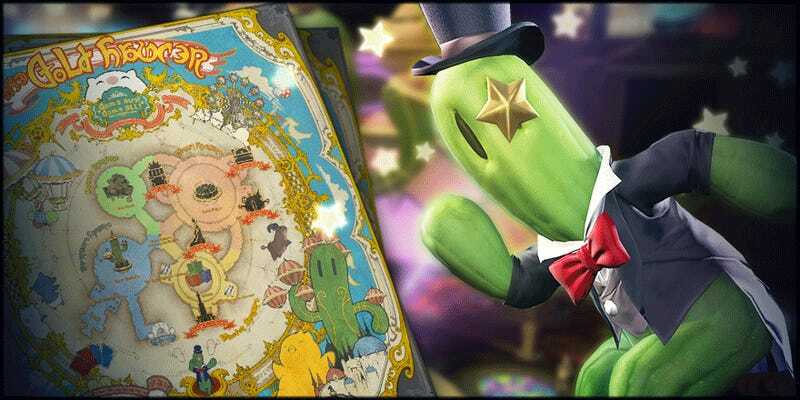 Check out Final Fantasy XIV's official Manderville Gold Saucer page for more info on the festivities. See you at the races!